Defending and 8 time champion Mike Leali is back to defend his title which he won in a 3-game finals match against Alex Beecher last year. This year Mike and Alex will face off in the preliminary 6-man round robin. Seedings are based on ratings and so the position of players in the tournament change from year to year as some players gain and others lose rating points. After the two 6-man round robin semi-finals, the winner of each section meet in the finals for the first to win 2 points with a lead. This year Daniel Garrett, Peter McConaghie, Kurt Bendoraitis, Len Brown, Matthew Leali and Michael Li form Group A. Michael Leali, Tom Taylor, Ron Suarez Owen Zhang, Alex Beecher and Adam Lonn form Group B.
Daniel Garrett defeated Pete McConaghie to join Adam Lonn, Kurt Bendoraitis and Alex Beecher with early wins. Two first round games remain to be played. Peoria Master Pete Karagianis and former Peorian Henry Getz tied for the title at the 55th annual Greater Peoria Open April held 6th & 7th at the Mark Twain Hotel in downtown Peoria. Pete entered late as he had to miss the start and Henry ran up 4 straight points before falling in the last round to Karagianis in an extremely exciting game. 58 players attended and had a great time enjoying the comfortable and spacious Packard Building playing hall. Alex Relyea, chairman of the USCF tournament director committee, traveled 1150 miles from New Hampshire just to play in the GPO. Full crosstables and prizes can be found at the tournament site here. Almost $2,000 in prizes were given out. 36 Peoria area players won silver or bronze medals at 2019 IESA State Finals played at the Peoria Civic Center February 22nd & 23rd. Dunlap Middle School team finished in the Top Four in all three grades, a rare sweep for IESA schools. Dunlap won the championship in 6th Grade and finished runner-up in 7th Grade and 4th in 8th Grade. Seven other Peoria area also schools made top 10 in one of the grades. Players played 7 games - 4 on Friday & 3 on Saturday. A perfect 7 wins in 7 games was required for Gold, 6 for Silver & 5 for Bronze. 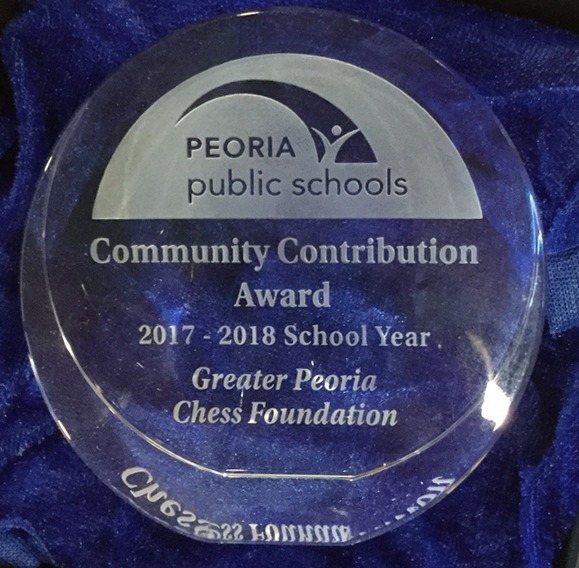 Peoria's own Pete Karagianis has been named US Chess Assistant Director of Events. "Pete’s calm demeanor, high energy and capable articulation will be valuable assets. He looks forward to sharing his vision of a quality event – a vision born from both his passion for the game and his wealth of experience within US Chess. We are happy to have him as part of our team." - US Chess.